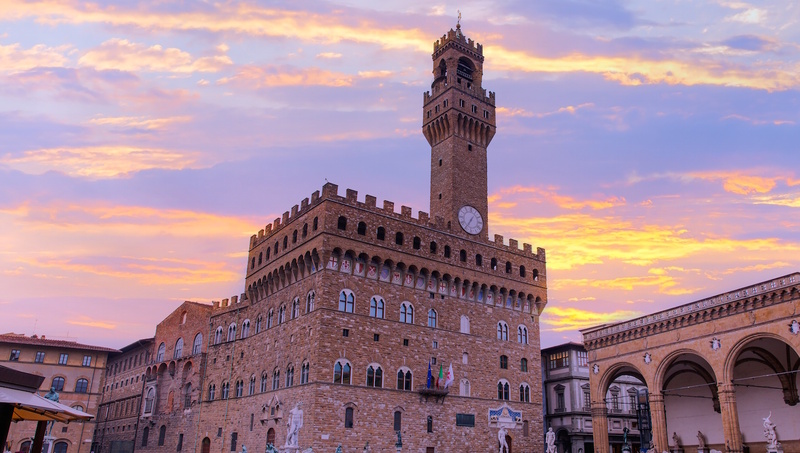 Palazzo Vecchio is one of Florence's premier museums, where you can explore many different layers of Italian history since Roman times. Although only accessible from underground - the Palazzo was built directly on top of it - the ruins of a Roman theater testify to this building's age. 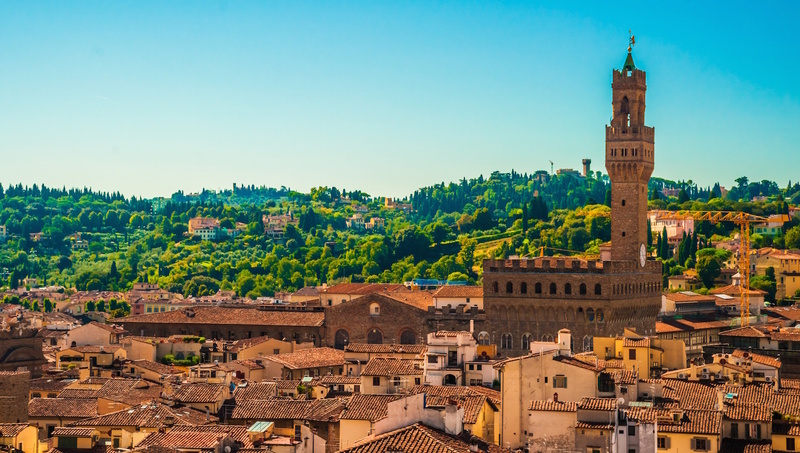 At 95 meters tall, this tower is the definitive symbol of Florence and absolutely the best place to take your pictures of the city's charming buildings. There's more to the fortress than the Tower. Construction of the fortress began in 1299 under Arnolfo di Cambio. Today its battlements and sturdy stone structure symbolize political potence from times gone by. This was built as the grandest room - originally intended to serve as the seat of the Great Council. Now it serves as the centerpiece for anyone's visit. 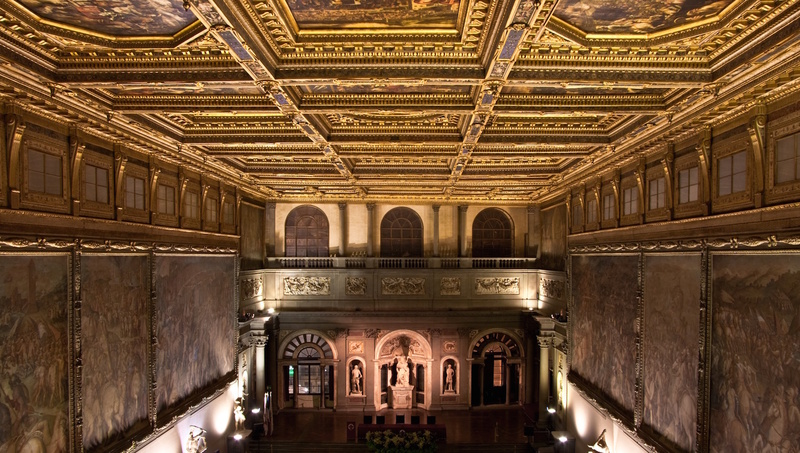 The maze of chambers with artwork and decorated ceilings by Michelangelo, among other prominent Renaissance artists, is not to be missed - you won't have seen anything like it quite on this scale! 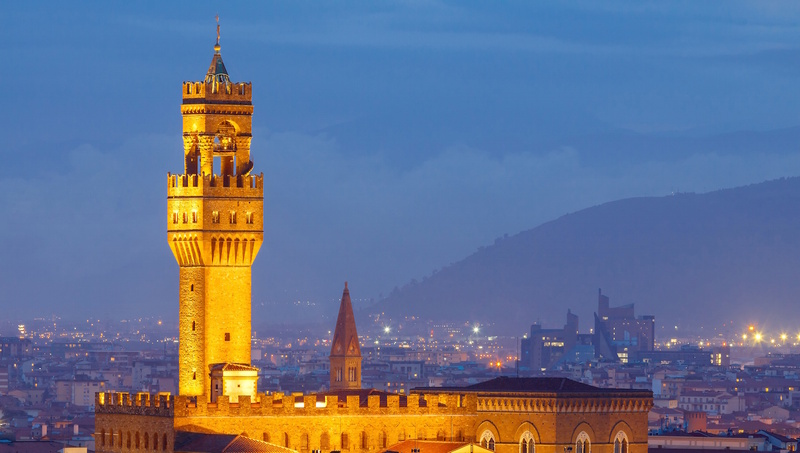 If rain is in the forecast, access to the Tower of Palazzo Vecchio will be suspended for safety reasons. Winter opening times for the tower are limited compared to summer (or high season), so if you're visiting between October and March, make sure to get there early in the day. The way to the top of the tower is 418 steps, so don't attempt to climb if it may put your health at risk - there is no elevator. On sunny days - and even when the sun's behind a cloud! - it's important to cover up with sunscreen. And even more so because you're nearly 100 meters closer to the sun! Open October - March, 9:00AM to 7:00PM. April - September, 9:00AM to 11:00PM. Special opening hours on Thursdays from 9:00AM to 2:00PM. Museum admission: 10euros. Tower and Battlements: 10euros. Discount available for students. Free to explore on your own or find a guided tour and receive insight into the many layers of history present. Located in the center of Florence at the Piazza della Signoria. As a top sight for Florence, be prepared for a bit of a wait to get in. If you get the Firenze card, you can skip the lines and get to the front. The steps outside the museum serve for a perfect spot to rest before or after your visit and take in prime Florence people watching and occassional street performances in the Piazza. Great tour, beautiful building, but be careful of which rour you buy! The Plazzo Vecchio is a beautiful building, well worth seeing, but be careful of which tour you select. The Museum Tour is different than the Tower Tour. If you want to see the inside of the building and a few artworks, select the Building Tour. If you want to get on the battlements and climb the tower take the Tower Tour. We waited through a long line for the Tower tour only to find we had Museum tickets and we could have walked right in to the Museum. The entrances are at the same point at the top of the stairs and there is no person or signage to explain this. The artworks in the Museum are not really worth seeing, especially compared to the Uffizi, but the Building itself is beautiful, especially nice is the Council Room. The Audio Guide we rented was worthless. The touch screen doesn’t work well, hard to use and confusing to operate. Plan on 1 hour for each for the Museum and Tower Tours. If you actually listen to the audio guide plan on 3 hours for the Museum Tour. Get there in the morning around 10 when the doors open and the crowds are almost non existant. It's a magnificent palace boasting the best from the brightest - and remember to get the audio set - lot's of interesting information here. The place is great, but the audioguide needs improvement. It was very confusing to use the audioguide, because there are no markings in the rooms corresponding to the stories in the audioguide. A few times we asked the guards for assistance but they were busy on their smart phones and were unhelpful except in one case. Most of them said that they didn't know the answer to our rather simple questions. Exceeded expectations. Lovely guide and great tour. The tour was wonderful and informative. Our guide was a lovely young lady who was extremely knowledgeable and got along well with our group. Great way to see the Palazzo Vecchio in his full glory! Our Tour trough the amazing Palazzo Vecchio was simply great and very informative! We met with our tour guide in front of the Palazzo and started our tour on time! Our tour guide was very kind and helpful with a lot of knowledge and had a lot of fun facts about the Palazzo Vecchio! 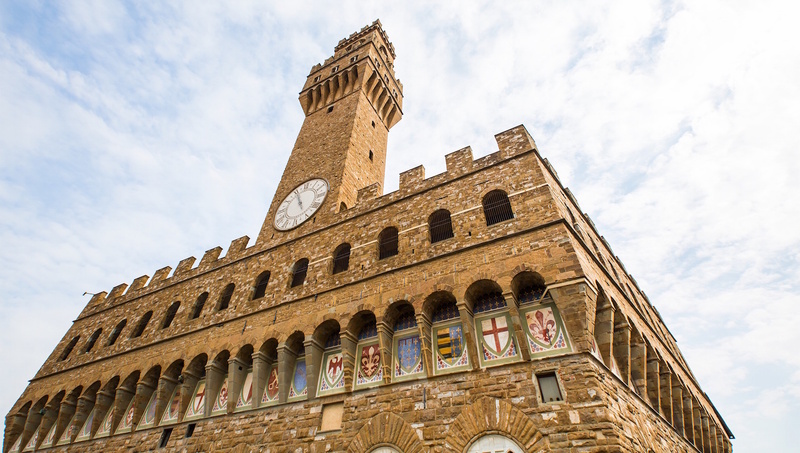 All the importand parts of Palazzo Vecchio were covered on our tour: the Room of the 500, the Medici private rooms, death mask of Dante and Cosimo's the 1st Room of Maps.